This week's tablehopper: punch the clock. 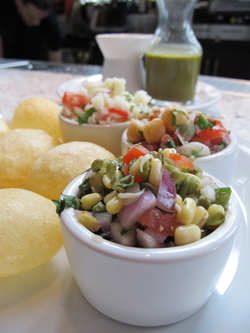 Pani puri at Dosa on Fillmore. And just like that, the weather has taken a dip. Downright cool, but so not cool! At least tomorrow’s tablehopper Indian Street Food event at Dosa on Fillmore is inside, so we’ll be toasty and warming up on things like spicy chiles and wine. There are still a few spots left in case you’ve decided you would like to feast on a ten-course Indian street food lunch with wine tastes for only $45. Hell yeah you do! I went to the pre-event tasting on Wednesday, and let me tell you, lunch is going to be a tour de force of flavor and texture. Lunch kicks off at 12 noon. This little Friday installment is all about an update on Tyler Florence’s Wayfare Tavern, opening next Tuesday. It’s quite the project, and the restoration was a wonderful homage to the historical building that it’s in. This week I also did a few updates to three of my older restaurant reviews: Cha-Ya, Fifth Floor, and Orson. Just scroll to the bottom of each review for the updates, and new pictures are posted as well.